Caissons, known as 藻井 (zaojing, literally "algae well"), are an ornate feature of Chinese architecture. Found in important buildings such as palaces and temples, they are decorated domes found on ceilings. 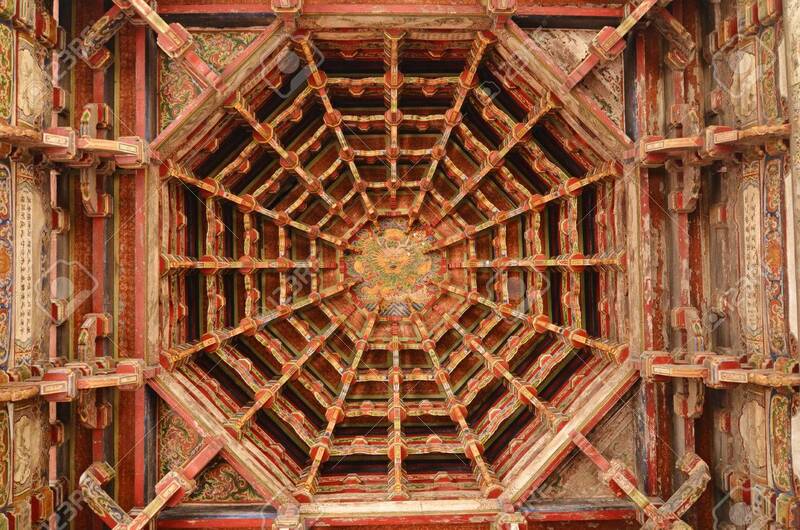 Traditionally comprised of elaborately carved wooden beams interlocked together in an octagonal pattern, they diminish in size leading to the top of the dome and give an illusion of a larger space. For this project, I wanted to pay homage to my culture, and incorporate this elaborate Chinese aesthetic into my work. In preparation, I visited several temples in my hometown of Taipei that boasted caissons. I was captivated by their swirling opulence and geometric lines. However, I veer towards clean lines in my aesthetic, so I lifted some elements: the black and gold coloring—often present in Chinese temples underneath the flashier red and blue—and the radiating geometric lines. There are three components to this outfit: the underlay is the quintessential Chinese dress, the Qipao (or Cheongsam), the collar is inspired by the Yunjian (literally “cloud collar”, popular in China since the 5th century), and of course the corset. The plain black qipao embellished with gold piping serves as a backdrop against the Yunjian, which directly evokes the Caisson in the Grand Palace Hotel in Taipei with its scallops and swirling gold clouds, and the corset, whose gold binding slopes like the roof of Chinese temples, and whose vertical gold lines represent the pillars holding the temple up. I used the “Easy Underbust” pattern from Corsets by Caroline. The pattern was fairly easy to alter to fit me, I just added 3 inches to the waist and 2 inches to the hip following the instructions that came with the pattern. The corset itself was constructed from two layers of cotton velveteen using the welt-seam method (I referenced tutorials by Sidney Eileen and from Foundations Revealed). I inserted gold piping into every seam, and bound the corset with matching gold bias binding. Spiral steels were inserted into every seam except for flat steels at the back, and a front-separating black busk was used. 12 eyelets on each side lace up the center back. Unfortunately I couldn’t find matching gold ribbon and so had to settle for black. This was the second corset I ever made (the first was for last year’s competition). This time round, the material I used was much easier to work with, and I have since acquired a tailor’s ham which made a world of difference when I was pressing the seams. The construction went pretty smoothly, since I’ve already used this technique before. I constructed the base Qipao from my bodice block, using black cotton and gold piping. The collar was made from interfaced Chinese brocade and backed with cotton, edged with gold piping as well, and topped off with a gold frog closure. This is my second year entering the FR contest. The hardest part of this contest was actually coming up with design ideas. I knew I wanted to do something inspired by Chinese temples, but I came up with and discarded at least ten iterations before I settled on the final version. The design is the hardest part! If you're wondering whether you should invest the (admittedly not a small amount of) time and money into the contest, I'd say go for it! Trying to come up with a design within the theme means I went out of my comfort zone and tried something that I wouldn't have otherwise. What an amazing leap between your two entries! This is a really gorgeous piece of work, it really captures the theme you chose. Oh I can see your inspirations so clearly here, the black and gold show off those lovely clean lines and an elegant fit too. Well done! Well done! That gold piping is such a pretty embellishment, and highlights the clean lines nicely. I saw this on Instagram, also, and I absolutely love your inspiration and your design! Thank you for your nice words! I actually started with an idea of an extremely colorful, literal interpretation of a red and blue caisson, but the fabric I had didn't work out and I had to scrap that idea and start again, pulling on the black and gold elements hidden in the architecture. I hope that I can finish another corset before next year as well, haha! I love how simple yet striking this is, and how very well styled is the look as a whole! Perfect background to shoot it in as well. P.S. I love your channel, can't wait for your corset video! It's hard to believe that this is only your second corset! I really love the inspiration you have chosen and how you have interpreted it. Simple yet striking and perfectly photographed too! Gorgeous inspiration and construction! I particularly like the idea of the gold piping on the corset representing the pillars holding the temple up. Congratulations on your stunning outfit! I particularly like your collar, and the gold piping on the corset! What a lovely ensemble. The elements you chose, the coloring and the clean lines, go so well with your "cloud collar". This is an elegant interpretation of your inspiration. Great job! Beautiful work Laurence! I really appreciate your inspiration and the way you've translated that in your designs. I love the gold piping on your corset! It can be so fiddly to do neatly and you've done a great job of it! This is so pretty! I really like the cloud collar detail, and all the information you included about it in your description! Your corset looks really clean and well finished. Marrying the corset with the Eastern inspired dress and collar is a beautiful combination and I think paring back your original design idea has resulted in something really classic and classy. .I love the gold piping which is so neat and the overall style of the complete look, beautiful. What a great outfit! I love how the simplicity of the design of the corset still manages to stay true to your original inspiration. The gold piping is beautifully inserted and works so well with the cape! Oh my gosh, you dont want to see pics of my second corset. You did so amazingly well! The whole recognising a very nice Chinese look. Please go on with your work and show it! I wish you luck and happiness at sewing! Well done! I love the clean lines and the corset fit looks great! I admire you for tackling piping on your second corset! The cape is gorgeous, and I think you captured and translated from your inspiration beautifully. I really like your design! Just beautiful, with the gold piping and binding! Well done indeed on the perfect piping and the classy design! I love the black and gold--so clean and classic! I never think to use piping until I see it beautifully used, as you did. And what a neat inspiration! I love the piping work and your use of the brocade design on the collar. The whole look really captures your theme. The setting for your photos was perfect.